More than 150 people, including Shorecrest parents, board members, faculty and staff gathered on February 28 under a bubble-filled sky to celebrate the opening of the first floor of the new 60,000 square foot facility and the building's new name — Charger Commons. 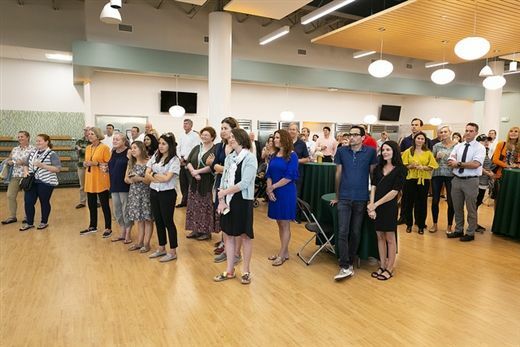 The Toast & Tour event provided an opportunity to toast to the tremendous progress of the reimagined lower campus and acknowledge the Shorecrest community for all of its efforts in making the first phase of the Transform Campaign a success. Guests toured the new building’s dining rooms, kitchen, library/media center, clinic, dedicated space for The Wonder Studio parent-toddler programs, and the state-of-the-art classrooms and playgrounds for The Experiential School of Tampa Bay. With Mike Murphy’s staple salutation, glasses were raised with a “Cheers!” to the generosity of the Shorecrest community and this campaign milestone.